Fantasy Drawing Tutorial by Ed Beard Jr.
Home » Fantasy Drawing Tutorial by Ed Beard Jr. In this 5 part video drawing tutorial, Artist Ed Beard Jr. takes you step by step through his process of drawing a fantasy scene from memory using no reference material at all. Ed says this is possible because of his years of studying anatomy and other subjects. In this first step, Ed will work on the background sky and clouds. He will be working on a completed contour line drawing entitled “Trumpeting Sentinel”. Ed always works on the furthest perspective plane first, working from top to bottom, left to right. He keeps the angle of his pencil strokes at a diagonal, from left to right, trying to be as consistent as possible. At this stage, Ed is careful to add enough graphite into the tooth of the paper so that he will be able to blend everything later on. He likes to work on his darks first and then his lights. As he works on his darks, he also likes to darken and strengthen the original contour lines of his drawing. Ed works on the robe once again. If you remember in part 1 , he started drawing in the robe. Now, using a blending stump, he works from the existing pencil marks, smudging and blending to shadow the mid tones. The blending stump he is using at this point has a really fine point to it. Its important to have a variety of different Tortillions to work with as you are drawing, meaning Tortillions with various points that have both a fine point and a blunt point. You can do this easily by simply drawing on a blank piece of paper and going over your marks with the blending stumps to create the desired heads. He then begins to work on the metal and chrome of the knight character. When doing highly reflective surfaces like chrome, you must first keep in mind where the light source is coming from, you must also keep in mind that in order to make it look realistic, you must put in reflected light as well as reflections from other objects. Ed goes into detail on how to do this in the video below. He then begins to work on the feathers of the bird. He begins by simply defining the feather lines at first. He will then later do more detailed work on the shadowing and texturing of the feathers. In part 3 of this fantasy drawing demo, Ed begins to do some detailing on the feathers. With a soft 2B pencil, he begins to add some of the dark shadows as well as redefines some of the lines. He also adds shadows and details to the head gear, the eye and the beak. He then focuses on creating a soft feathering effect on the main wing of the bird. He contours and outlines each of the feathers as he did on the head. He is really pushing the pencil hard on the left side of each of the feathers as this is where the shadows reside. He adds some fine details to these feathers as well. He works his way down the bird detailing the feathers on the tail and the legs. He then begins to work on the talons. Ed starts part 4 of this drawing lesson with some more blending using various blending stumps. He then moves on to the background and the other figures in the drawing. He starts with the mountain terrain in the background. Same process as before… He applies the graphite and then uses the tortillion to blend and smudge. He then moves on to the architecture, redefining lines and adding shadows. Throughout the entire drawing, he is careful to keep his shadows on the left making the light source consistent and realistic. He then moves on to the crystals where the bird is actually perched. He then works on the background characters and the main tower. 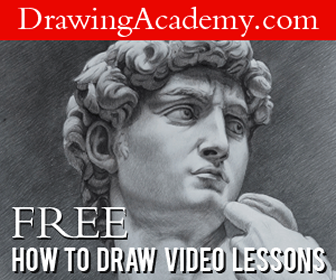 This is the last part of this fantasy art drawing lesson by Artist Ed Beard. He begins part 5 by finishing up the main tower, the crystals at the top of the tower and the shingles at the bottom, with some blending using the blending stump. He finishes off the last part of the background, the mountainscape. He then moves on to the final touch ups. This is where he puts the kneaded eraser to good use to pick out some high lights and to erase some of the over smudging. The kneaded eraser can also be used to soften shadows..